Irvington is situated in an area that encompasses the northern section of the original William and Elizabeth Irving Donation Land Claim (DLC) of 1851 as well as several small adjoining subdivisions. The Donation Land Claim Act of 1850 granted 320 acres of designated areas free of charge to every unmarried white male citizen eighteen or older and granted 640 acres to every married couple arriving in the Oregon Territory before December 1, 1850. In the case of a married couple, the husband and wife each owned half of the total grant in their own name. The law was one of the first that allowed married women in the United States to hold property under their own name. DLC's were intended to promote homesteading in the Oregon Territory (comprising the present-day states of Oregon, Washington, Idaho, and part of Wyoming). The Donation Land Claim act brought thousands of white settlers into the new territory and encouraged thousands of settlers to head out on the Oregon Trail. The geographic position of the Irvington neighborhood in Portland also had a significant role in its development in the late nineteenth and early twentieth centuries. In the 1880's, Irvington was cleared farmland, located on the undulating plain just northeast of the commercial hub of Albina (incorporated into Portland in 1891). The area was well suited for an orthogonal grid of streets and rectangular blocks that did not need to navigate around or through many natural obstacles. Indeed, the topography within the neighborhood was remarkably unvaried, with the elevation gradually falling from west to east from about 180 feet above sea level near Irving Park in the northwest part of the neighborhood to about 160 feet near NE 27th Avenue. These physical characteristics as well as its convenient position just over a half mile from the Willamette River crossing at the Steel Bridge and a quarter mile from the 1912 Broadway Bridge proved critical to Irvington's attractiveness to investors, homebuilders, and would-be homeowners. The impetus for development of Portland's so-called "East Side" was intimately tied to the construction of the Oregon Central Railroad terminus on the east side of the Willamette River in 1868. The community of Albina formed immediately above the east bank of the Willamette River to service the railroads and steamboat docks that lined the river's edge. While ferry service between the east and east sides provided a link between Portland and Albina, bridges were soon constructed to facilitate commerce. A railroad bridge at the current location of the Steel Bridge was erected in 1888. The very next year, the first electric railway crossed the Steel Bridge into Albina and East Portland (which were incorporated into Portland in 1889). The streetcar eventually extended beyond Albina to Irvington, gradually transforming this former farmland into an urban residential enclave. Connecting service along interurban routes connected Irvington residents to communities outside of the city as well. The impact of the streetcar on Portland's east side was dramatic. In 1891, twenty-five percent of the greater metropolitan population resided on the Eastside. By the 1910's, that figure rose to fifty percent. Portland was following a larger national trend in urban to suburban migration. As historian Alan Gowans noted "by the 1980's, most of the well-to-do were gone from inner cities, and by 1900 the middle class was well on its way out also...out to the suburbs.". In anticipation of this growth and the associated housing need, portions of the east side donation land claims, including William and Elizabeth Irving's DLC were subdivided into a grid of blocks and streets for residential development. Beginning in 1882, the Irving's descendants, their daughter Elizabeth and grandson John Irving, sold off significant portions of the DLC. On March 1, 1882, John Irving filed a plat for "John Irving's First Addition to East Portland" and on April 21, 1882, he and Elizabeth Irving sold 288 acres of the DLC to business partners David P. Thompson, Ellis G. Hughes, and John W. Brazee for $62,109. The Irvings as well as Thompson, Hughes, and Brazee (and subsequent investors such as Charles Prescott) worked together to develop the area in a relatively uniform fashion. In 1887, when the plat for Irvington was filed, it included property owned by the partnership and the Irvings. The 1887 plat forms the bulk of present day Irvington. Due to slow growth in residential sales on the Eastside, lots were not actively marketed until 1890-1891. As these original developers gradually sold off their shares of the original development to subsequent real estate developers, plats for these smaller portions of the neighborhood were often re-filed once the new developers recognized a market for the land. The 1906 Portland plat map reveals how the original Irvington plat had been platted by different owners who named the new plats East Irvington, West Irvington, and Edgemont. Despite this fracturing of ownership of the neighborhood, the original grid pattern of the neighborhood was retained. The current grid road network evokes the planning associated with the original platting of Irvington in 1887. Learn more about how to interpret your home’s location by reading “What’s in a Name, What Makes Irvington, ‘Irvington’“. While a large majority of the neighborhood streets contain a sixty-foot right-of-way, Knott Street, NE 17th and NE 21st Avenues were intended to carry more traffic through the neighborhood. They feature an eighty-foot right-of-way. The rectangular-shaped blocks, with the longer sides running north to south, are generally composed of twenty fifty-foot by one hundred-foot parcels. While most of the houses are oriented on an east/west axis, a number of larger parcels situated on east-west streets exhibit dwellings constructed on a north-south axis. These houses tend to be clustered along sections of Siskiyou, Stanton, Knott, Brazee, Thompson, and Tillamook Avenues. The grid network of streets was not uncommon during the streetcar suburb development era. Developers platted rectilinear subdivisions where homes were built within walking distance of the streetcar line. As with Irvington, these subdivisions were often extensions of the pre-existing urban “gridiron”. This common form of subdividing land made land surveys easier, facilitated the sale of individual parcels and arguably promoted speculative land development in cities all across the United States. Both the Irvings and the partnership held a common vision for Irvington that included the use of restrictive covenants as a term of sale that was attached to the recorded deed. A seller could abrogate the contract of sale and/or enforce the conditions if the owner failed to abide by the contract. Owing its origins to mid-eighteenth century efforts by British nobility to retain control of properties sold off of noble estates, restrictive covenants were still very much the exception in the United States in the 1880’s. In the face of uncontrolled and largely unregulated urban development occurring throughout the United States, real estate investors and developers resorted to limited duration covenants in an effort to protect their investment until sales of lots were completed. Covenants also protected lot values for those who had already purchased and/or occupied lots within the subdivision. The covenants used in Irvington were much more extensive than those used in SE Portland’s Ladd’s Addition neighborhood which merely forbade the selling of liquors within the subdivision. During the period of 25 years from and after the first day of July 1891 and until after the first day of July 1916, no intoxicating liquors shall be manufactured, sold or otherwise disposed of as beverage in any place of public resort on the premises...nor shall said premises at any time during said period be occupied or used for any shop factory, or other place of business, or be used for the carrying of any livery stable, laundry, foundry, or of any trade or business whatsoever, not for use other than residence purposes, nor be in any manner used or occupied by Chinese other than as the said Chinese may be employed by residents thereon as house servants, no building to be within 25 feet of the street and no building to cost less than $2500 under penalty of forfeiture. While the baseline value of the improvements to a lot vacillated between $1000 and $2500, these restrictions ensured a degree of conformity to the residential architectural forms, property use, and socio-economic status of the neighborhood. Similar restrictions were placed on properties in subsequent developments in Portland in Alameda Park (1909) and Laurelhurst (1909). Irvington’s extensive use of restrictive covenants, therefore, marked a significant event in the emergence of the city’s streetcar suburbs that would eventually be replicated elsewhere. Marketing Irvington began in 1891, as did the construction of water mains, graveling of the streets and laying of plank sidewalks. Lot sales in Irvington proved slow as the early developers opened up lots largely located in the southwest quadrant of the neighborhood between E 7th and 14th Avenues and Tillamook and Thompson Streets. This is attributed to the subdivision’s relative isolation prior to the construction of streetcar lines that served the neighborhood. The stock market crash of 1893 all but stopped lot sales in Irvington. In 1898, investors opened up lots for sale to the public again. Prior to the 1893 crash, the early real estate investors of Irvington managed the risks of their real estate venture by gradually releasing parcels within the neighborhood to individual property owners or to small scale speculators who often constructed homes on individual lots rather than entire blocks. The Portland Cottage Building Association (PCBA), for instance, was one of the earliest homebuilding speculators in Irvington. Under company president Henry M. Lambert, the PCBA developed several parcels in West Irvington between NE 12th and NE 16th. Lambert was also the owner of the East Portland Mill and Fixture Company, a planing mill and house parts producer that made moulding, window sashes, and other interior fixtures and hardware. Sensing a logical extension to his building-parts business, Lambert applied his company’s architectural products to a number of homes that the company constructed in Irvington. Lambert’s business model consisted of purchasing properties from one of the original investors, erecting a home, and selling the property. In some instances, the company also extended a mortgage to the new owner. In at least one instance, the company erected a duplex; one of the earliest remaining in Portland at 2134-2136 NE 19th in 1892. In most instances, however, the PCBA constructed one story frame dwellings with Queen Anne architectural detailing that placed an emphasis on varying textures and form elaboration. They featured varying shingle patterns with sawtooth, square, and fishscale treatments. Building corners on visible elevations were often clipped and eaves were emphasized through the use of turned and jig sawn woodwork. The roof types were often complex featuring clipped gable roofs with projecting gable extensions. The plans of these early homes often lacked hallways but focused more public spaces such as the parlor and dining room to the front of the house with kitchen, bathrooms, and bedrooms to the rear. The Roome-Stearns House at 2146 NE 12th is a particularly well-preserved example of a PCBA cottage that retains many of these characteristics. The number of these cottages constructed would be limited, however. By 1894 the PBCA dissolved as a result of the financial troubles that emerged during the Bank Panic of 1893. Not every home in Irvington was erected as speculative venture, as one of the earliest residences remaining from the 1890s is the John E. Povey House at 1312 NE Tillamook. Probably constructed by Peter Hobkirk of the contracting firm of Hobkirk and McKenzie, the Queen Anne style house represented one of the more ornate houses on the eastside of Portland during the period, but it was most known for the extensive use of stained glass from Povey’s own glass works. The Povey Brothers Art Glass Works were widely known as the leading manufacturers of “art” glass in the region between 1890 and 1920. Numerous Irvington homes incorporated Povey stained glass. Perhaps the largest residence erected in Irvington during this early period was the George Earle Chamberlain House at 1927 NE Tillamook. Designed by the prestigious architectural firm of Whidden and Lewis, the house represents a relatively uncommon example of the Shingle style in East Portland. Both Whidden and Lewis once worked for nationally significant architectural firms in the East prior to their arrival in Portland; McKim, Mead, & White and Peabody & Stearns respectively. The pair would have a significant impact upon domestic and commercial architecture in Portland in the late nineteenth century. The early development of Irvington in the 1880s and 1890s conveys the challenges facing real estate developers and housing speculators during the period. Due to fluctuating housing and financial markets, much of Irvington lay undeveloped by the turn of the century. As the 1894 Paving Map of Portland relates, grading and gravelling of the subdivision’s roads had not occurred north of Thompson Street. Indeed, of the 2,804 historic resources located within the Irvington Historic District, only about 53 pre-date 1900. All of this changed, however, with the expansion of Portland’s streetcar system. 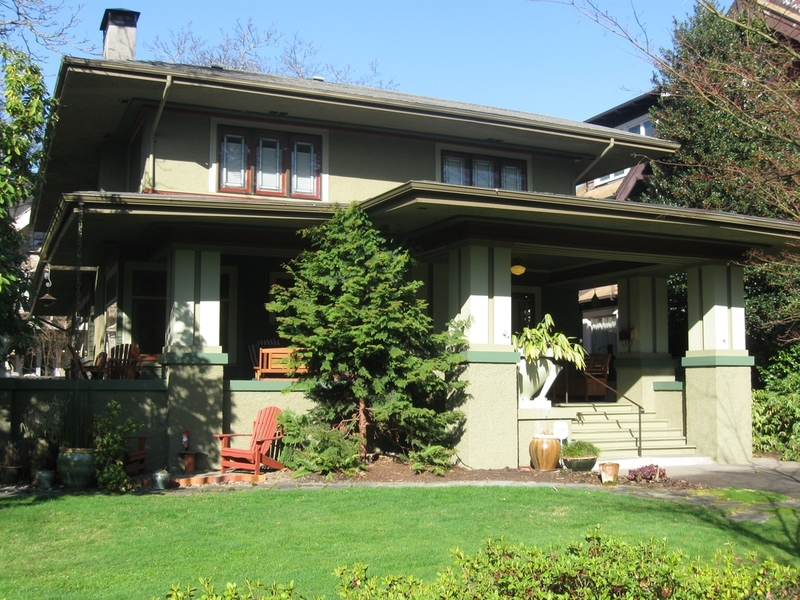 Irvington became one of the most well served residential neighborhoods in east Portland by the 1920s. 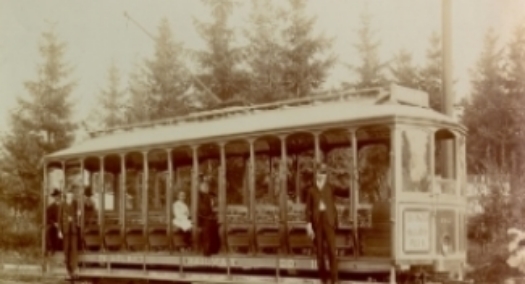 In 1899, a new streetcar line was installed down East Broadway and up 22nd Avenue to Tillamook Street, which dramatically improved the commute time between downtown Portland and Irvington. Soon after the line was completed, lot sales increased within Irvington. By 1912, several different streetcar lines were extended into Irvington along Broadway as well as 15th, 22nd, and 24th Avenues that connected the neighborhood to an extensive network of routes that served much of the city. Other developments south of the original plat within the current neighborhood of Sullivan’s Gulch, such as John Irving’s 1st Addition and the Holladay Park Addition were also opened for development and were considered by real estate agents during that early period as part of Irvington. Both of these new developments also used restrictive covenants as a means of controlling how individual lots were developed. To provide Irvington with the necessary utilities and amenities, the City of Portland spent $250,000 to develop water mains, gas lines, sewers, and street paving. The first major building boom of Irvington occurred after the 1905 Lewis and Clark Centennial Exposition in Portland. Many people who attended the Exposition relocated to Portland after witnessing first-hand the amenities of the Pacific Northwest. These included an extensive natural resource base that made Portland the largest lumber manufacturing city in the United States as well as a budding shipping center with wholesale distributing, construction, and finance industries. Between 1900 and 1910, the population of Portland more than doubled from 90,426 to 207,214, thus ushering in a period of dramatic growth for the city. The increase in population made Portland the third most populous city on the West Coast behind Seattle and San Francisco. Between 1900 and 1910, at least 405 of the 2,804 buildings that currently exist in Irvington were constructed. The second building boom occurred in the 1920s when 1238 of the existing 2,804 buildings were erected in Irvington. Money spent citywide between 1921 and 1925 on building permits alone rose from $17 million to $38 million. In the boom years of the early twentieth century, builders in Portland erected an average of 3,400 new houses a year. By 1930 the population had expanded to nearly 300,000. Responding to expanding consumer markets elsewhere in the United States, Portland became a major manufacturing and banking center. Beginning during the first building boom, NE Broadway gradually assumed a commercial role. Due to the restrictions on commercial activities within the Irvington, Broadway became a logical outlet for commerce and more dense development. In 1912, Commercial enterprises along Broadway were interspersed amongst residences in the early 1900s and 1910s. By the 1920s, following the expiration of the restrictive covenants, more intensive commercial development began to emerge. This included the 1927 Olsen and Weygandt Building at 1421-1441 NE Broadway that exhibited modest Mediterranean ornament along its multiple storefronts. Auto-oriented garages and parking lots took their toll along Broadway. Many formerly residential properties were converted into stores. This evolution typically involved the construction of a one story storefront extended to the property line immediately in front of the house. By 1950, this process of commercial conversion was well underway. This gradual evolution from residential to commercial in the southern area of Irvington was typical of the type of development that occurred in streetcar suburbs in the early twentieth century. In the interior of the neighborhood, prospects arose for more widespread commercial development as the first of the restrictive covenants were set to expire in 1916. Merchants stood ready to take advantage of the lapse. In a sign of just how important these covenants were to the residents of Irvington, 450 residents attended a meeting to discuss the issue after a rumor emerged that a small grocery store was set to be built in the middle of Irvington. Despite citizen threats of a boycott, the Schafer & Vinton grocery store was erected, but it was designed to look like a house. In order to minimize the threat of commercial development in the future, citizens devised a scheme to re-issue their deeds through a trust company with another set of restrictive provisions. Even though not all owners in Irvington took this step, the Schafer & Vinton store did have a profound effect upon residential development in the neighborhood. In another incident in 1918-1919, in one of the first matters handled by the newly formed Portland Planning Commission, an auto garage planned to open in the middle of Irvington. After holding public meetings, the Planning Commission managed to convince the garage developer to move to another location outside of the residential neighborhood. The conflict over the grocery store symbolized a broad recognition within the community of a need to segregate land uses in order to preserve property values and neighborhood character. When the grocery store was designed to look like a house, it reflected the profound impact of citizen involvement in Irvington and the prevailing desire for architectural design to minimize changes in land use. Other subtle expressions of architectural illusion emerged throughout the 1910s and 1920s as non-single-family-residential buildings throughout the neighborhood were designed to look like homes. The fire department, for instance, met resistance when a fire house was planned on NE 24th. The firehouse was subsequently designed to look like a house. 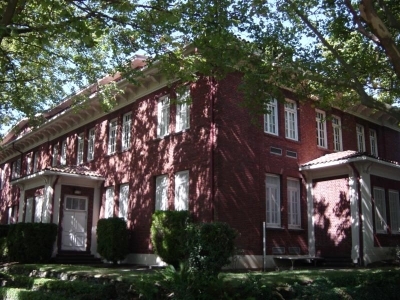 The two story, brick telephone exchange on NE 24th built in 1920-1921 was designed to look like a Mediterranean villa merged with a Georgian mansion. Frederic Bowman designed the Irvington Bowman Apartments at 1825 and 1835 NE 16th in the Arts and Crafts style and the well-appointed F.E. Bowman Flats at 1624-1636 NE Tillamook. Both were conveniently close to the new streetcar lines, but on the outskirts of the Irvington Neighborhood. Several large homes near the streetcar lines in the neighborhood were actually duplexes or four-plexes consciously designed with hidden or ancillary entrances that obscured their multi- family function. Even the Madeleine Church and School featured a building form and style consistent with the surrounding scale and architectural character of the neighborhood through its distinctive Tudor style and Collegiate Gothic exterior. The pressure to build in an appropriate style during this period, therefore, came as early as the 1910s, as Irvington residents expressed the importance of residential use and architectural design. Despite citizen interest in maintaining the single family residential character of Irvington, apartment buildings were nonetheless constructed along the edges of the neighborhood in the 1920s and 1930s. The La Bonita Apartments at 2502 NE 11th Ave, constructed in 1930 by developer Charles Fulton exhibited Spanish Colonial ornament through its abbreviated pantile roof and stucco exterior and followed a familiar courtyard plan. The building offered relatively inexpensive housing that consisted of one bedroom apartments. Due to the large numbers of buildings erected during the building booms of the 1910s and 1920s, Irvington contains the largest, most intact collection of early twentieth century residential architecture found in Oregon. Influenced by a profound group of real estate developers, speculators, build-design contractors, as well as architects, the neighborhood exhibits an eclectic collection of early twentieth century architectural styles. The neighborhood represents a laboratory of architectural design for the period and conveys how builders and architects alike negotiated the desires of their clients, a competitive housing market, and the intricacies of period associated with distinct architectural styles were often mixed together to create altogether unique compositions. Irvington’s architectural diversity was marketed to the middle and upper middle class residents of the city as Irvington quickly garnered working class as well as wealthy residents. City directories and census records from the period reveal sales clerks, judges, lawyers, company executives, merchants, retirees, lumbermen, draftsmen, druggists, dentists, doctors, nurses, traveling salesmen, steamboat captains, streetcar conductors, civil servants, stenographers, police detectives, teachers, railroad engineers and workers, business managers, civil engineers, newspaper advertising executive, stockbrokers, film projector operators, grain dealers, an Indian trader, cannery owners, auditors, as well as several architects, carpenters, and builders. While some of these residents could afford architects to design their homes during the boom, many others purchased homes erected by speculators who tried to anticipate the tastes of their customers. By the early twentieth century, speculative builders became a much more common alternative in Portland if not across the United States. In Seattle, for instance, “Bungalow Craftsman” Jud Yoho epitomized small-scale speculative housing developers who sought to bring the middle class into a more consumer-oriented economy and society. Yoho developed a booklet replete with house plans and specifications for consumers to choose from and was moderately successful in selling plans, building homes, and extending credit to prospective buyers. The Rice Construction Company, led by Robert and Archie Rice were one of the most prolific speculative builders in Irvington. One recent study found that at least thirty five residences in Irvington constructed between 1910 and 1926 are attributable to the Rice Brothers. While speculative builders, designers, and contractors remained an effective force in the design and construction of homes in Irvington throughout the building boom period, residents also called upon professional architects to design homes that were tailored to their more specific needs. Some of the most significant architects in Portland, if not Oregon would team with some of the contractors noted above but would supply the designs for residences, institutional buildings, and at least two of the churches. Ellis Lawrence, Albert E. Doyle, Raymond Hockenberry, Frederic Bowman, David L Williams, Josef Jaccobberger, and John Virginius Bennes all landed significant commissions in Irvington. Twenty six residences in Irvington that were designed and built by these individuals and firms have been recognized through individual listing in the National Register of Historic Places. Architectural design in the early twentieth century was marked by a blurred line between professional architects and their designer, contractor, and builder counterparts. It was not until 1919 that the distinction became clearer when a licensing system was put in place in Oregon for architects. Nonetheless, the maturation of industrialized building component manufacturing, mail order catalogs, pattern books, as well as popular magazines with plan services continued to be an inexpensive alternative to architect-designed residences and significantly increased design choices. In the early twentieth century, Gustav Stickley’s The Craftsman magazine popularized the latest architectural styles during the period. The Ladies Home Journal also supplied plans and fanciful drawings to even broader audience with through its subscriptions in excess of 1.6 million by 1915. Property owners took inspiration from these publications but sometimes still desired architectural services to implement a project. Lewis T. Gilliland, for instance, hired architect Ellis Lawrence to construct a home whose plans and elevations appeared in a 1907 issue of Stickley’s The Best of Craftsman Homes. Local construction companies in Portland also developed smaller scale pattern books. The Matot Construction Company and the Fenner Company supplied plans and materials to at least six homes in Irvington. The residences, apartment buildings, and commercial buildings erected by the architects and builders in Irvington during this period, reflected the extensive influence of the Arts and Crafts movement. A reaction to the rapid industrialization of the modern world and the desire for machine-manufactured goods, the Arts and Crafts Movement centered on the inherent virtuousness of handicrafts and the craftsman and the “search for a way of life that was true, contemplative, and filled with essences rather than superficiality....” The style was also meant to express the simplicity. Beginning in Europe, the movement soon found devotees throughout the United States as well as in Oregon. Architects, builders, and architectural promoters also found inspiration in the Shingle style, Spanish Mission Style, Mediterranean, Bungalow, Swiss Chalet, and Japanese architecture in addition to the Arts and Crafts Movement. The Prairie Style, largely inspired by the work of Frank Lloyd Wright, was yet another permutation of the period which sought to express simplicity, natural materials, and economy. A distinctively different, but philosophically linked style, the Colonial Revival, is also found in abundance in Irvington. Drawing from a more academic and antiquarian inspiration, this style sought to evoke the colonial origins of the United States as well as the Classical formalism of Rome and Greece by calling upon surviving historical buildings, in part or in whole, as worthy of replication. While the formality of the Colonial Revival seems at first conflicting with the informality of buildings in the Arts and Crafts movement, both reflected a romanticized view of the past – whether in the United States, England, Italy, Japan, or even Switzerland. Large architectural firms in the eastern United States began drawing inspiration from historical models or composites of existing models to develop styles reminiscent of the past as early as the 1870s. U.S. centennial celebrations in 1876 became the catalyst for decades of residential architecture drawing on elements of the Colonial past. This trend reflected a more academic and antiquarian design ethic that sought to replicate distinctively “American” architectural traits. After the World’s Columbian Exposition in 1893, architectural detailing more closely associated with Greek and Roman architectural antiquities became intertwined with domestic colonial forms to create unique compositions. Gambrel-roofed "Dutch Colonials", Palladian-influenced Georgians, joined dozens of simple homes sporting pedimented porches and classical columns. While influenced by the popular architectural movements, the architecture of Irvington epitomizes the “harmony in diversity” moniker that author Michael Shellenberger used to describe the work of Ellis Lawrence. Lawrence was known for his creative design flair that intermingled stylistic components with “an unerring good eye for composition and proportion” that fit the needs of the building or his clients. Indeed, his commissions featured the “unexpected juxtaposition of different styles and shapes, mixing traditional details with modern, and formal exteriors with informal exteriors or vice versa.” Lawrence himself often avoided trying to pinpoint the style of his buildings for he once responded to a questioner about the style of the University of Oregon’s Chapman Hall that “it just ain’t pure enough to be branded.” Lawrence would go to form the University of Oregon’s School of Architecture and also found The Builders Exchange, Oregon Building Congress, and became the president of The Portland Architectural Club. Setting the architectural standard in Irvington, Lawrence designed his own residence at 2201 NE 21st Avenue, a duplex, along a major road that served as a highly visible advertisement for his work. The house has been credited as being one of the earliest examples of the Arts and Crafts style in Oregon when it was erected in 1908. The house’s unusual orientation with its side elevation facing the street, extensive use of natural materials as exterior sheathing, asymmetrical fenestration and complex roof forms represented a creative composition for the period. and the 1915-1916 John and Ellen Bowman House at 1719 NE Knott. While Lawrence was an architect with a well-known penchant for architectural eclecticism, the residences in Irvington actually relate an overall story of architectural transition and diversity. The Gustav Freiwald House at 1810 NE 15th Avenue is an excellent example of the gradual transition between the conventions of the Queen Anne and Craftsman Styles. While bearing the architectural hallmarks of the Queen Anne period such as a multi-sided tower, projecting dormers, asymmetrical roof, and rambling wrap around porch, the house featured bold Colonial Revival detailing such as the colonial style columns, corner pilasters, and pediments. One of the most grandiose stylistic combinations was composed by architect David L. Williams at the Lytle House at 1914 NE 22nd. Williams skillfully merged the boldness of the Colonial Revival through a two story portico supported by fluted columns with characteristics of the Mediterranean Style through a stucco covered exterior, pantile shallow pitched hip roof and a broad terrace. Indeed, most, if not all of the architects and builders in Irvington operated within a more recognizable and established architectural style or paradigm. Architect John V. Bennes, for instance, designed a very conservative academic interpretation of the Colonial Revival style for the 1917 Coleman-Scott House at 2110 NE 16th. He was better known for his Prairie style dwellings such as the 1909 Marcus J. Delahunt House at 1617 NE Thompson St.
Frederick Bowman could point to an architectural portfolio that included the Mission Style 1910 Walpole House at 2524 NE 19th Avenue, the Bungalow Style cottage at 2416 NE 20th Avenue, as well as an Arts and Crafts Style foursquare at the 1910 McBride House at 2401 NE 23rd Avenue. Even as the wealthier residents of Irvington were purchasing speculative dwellings or commissioning custom designed homes, working class residences were not devoid of architectural character during the period. The one story Hedrick House at 2437 NE 10th, for instance, reflected a much plainer architectural aesthetic but still exhibited classically-inspired porch columns, a porch roof with cornice returns, and a bilaterally symmetrical fenestration that together suggests the Colonial Revival Style. Other smaller homes in Irvington exhibited Spanish Revival, Arts and Crafts, Tudor, English Cottage, or a mixture of these styles that communicated the general historic architectural revivals that occurred in the early twentieth century, but that lacked an academic attribution of a particular style. With the beginning of the Great Depression in the late 1920s, home building slowed. Those homes that were constructed during this period were smaller in size. The Hughes Investment Company sold the remaining blocks in the northern portion of the Irvington Neighborhood. The houses that were built during the 1930s continued to be trendy even though somewhat smaller. The school also became a virtual exhibition of Works Progress Administration artwork. Artist Edward Burns Quigley painted a series of murals depicting the “Settling of the West” in the lobby. Wood carvers Valentine Weise and Aimee Gorham created several wood inlay panels. Many of cottages in Irvington constructed in Irvington in the 1930s were constructed in the English Cottage and Tudor Revival styles. Other trendy styles included the Mediterranean and the Cape Cod Colonial Revival. The “Cape Cod” especially grew in popularity in the 1930s through the 1950s due to the shrinking family size and cost of construction. In many ways these residences hearkened the end to the nostalgic ideas espoused by the Arts and Crafts Movement and Colonial Revival practitioners as houses were increasingly stripped of obvious architectural forms. A group of Cape Cod cottages were built in the late 1930s between NE 21st and NE 22nd south of Brazee Street. While the overall forms for these houses were linked to the cottages quaintly associated with Cape Cod in Massachusetts, the oversized multi-paned windows, minimal woodwork, and use of more modern architectural construction materials made them distinctively different. The Minimal Traditional style, even more loosely based on the revival styles of the 1920s and 1930s, was also a response to the economic depression. This style was promoted by builders who saw them as efficient and affordable solutions to home building. The Depression years gave way to a period defined by World War II, which fueled demand for new technology associated with the war effort. Portland’s shipping and ship building industry grew as a result of the military’s demand for goods and ships. The local labor shortage, compounded by men being sent away to serve in Europe, necessitated the import of labor. Workers from around the country were recruited, which resulted in a demand for affordable housing especially rental units. Many residents subdivided their properties or homes as a form of supplemental income. In addition, residences were converted into boarding or rooming houses. In addition to residential development, three church buildings (Augustana Lutheran Church, Holladay Park Church of God, and Central Lutheran Church) were built in the residential portion of the neighborhood previously off limits to such development due to deed restrictions. Particularly notable was the Central Lutheran Church, a City of Portland Historic Landmark designed by Pietro Bellushi which was built on the east side of NE 21st between NE Schuyler and Hancock Streets. In the years after World War II, the demographic composition of Irvington gradually changed. By the 1960s, the western section of the neighborhood, for instance, was reported to contain a population largely dominated by African-Americans who were moving from the nearby Albina neighborhood. A city study also noted that property owners outnumbered renter occupied properties by only 6 to 1. African American residents continued to move from Albina to Irvington in the 1970s to improve the living conditions their families. Throughout the 1960s and 1970s, commercial and apartment developments increased dramatically in response to the development of the Lloyd Center to the south of Broadway. This development encroached on a lot by lot basis in the smaller blocks of the Holliday Addition portion of the neighborhood. In order to increase the voice of its residents in planning decisions, the neighborhood formed the Irvington Community Association in 1966. The ICA began a campaign to improve their neighborhood by leading fights to end the “red lining” of the area west of NE 15th and by increasing public awareness of the neighborhood’s historical importance. In 1992, the City of Portland designated a large portion of the neighborhood a Conservation District. Finally, in 2010 the entire neighborhood was listed on the National Register for Historic Places.